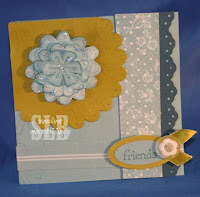 Here's a card I did for a recent swap with my online group of Demo friends. They ladies are the most remarkable stampers. I hope to share some of their creations with you soon but need to ask permission first! Anyway, here's my card. All products from Stampin' Up! Small oval punch, large oval punch, eyelet border punch, Crafter's tool kit, Button Latte, Kiwi Kiss satin ribbon, dimensionals, Crystal Effects, Dazzling Diamonds, Baja Breeze striped grosgrain ribbon. The DSP was run through the Big Shot using the Texturz plate and then sanded to show the white dots! I'm going to a scrapbook retreat this weekend. Hopefully, I'll have some layouts to show you when I return! This is one of my very favorite cards! Sooooo beautiful! THANKS! The colors are beautiful and I love the layered flower.